The main difference between wings of insects and birds is that the wings of insects lack bones whereas the wings of birds have bones. Furthermore, the wings of insects have a number of longitudinal veins, which are cross-connected, while the wings of birds are covered with feathers. Moreover, insects have two pairs of wings while birds have a single pair of wings. Wings of insects and birds are two analogous structures developed in unrelated organisms in order to adapt similar environmental conditions. The wings of insects are the outgrowth of the insects’ body, aiding them to fly. Generally, insects are hexapod invertebrates that are a form of arthropods. Insects make the largest animal group within the phylum Arthropoda. They are characterized by the presence of an exoskeleton made up of chitin, the presence of a segmented body into the head, thorax, and abdomen, the presence of three pairs of jointed legs and by the presence of compound eyes and one pair of antennae. Generally, insects have a pair of wings known as the forewings and hindwings. They emerge from the second and the third thoracic segments. However, some insects have only one pair of wings. A number of longitudinal veins provide the strength to the wings. These parallel veins are cross-linked by other veins, forming a cell-like structure. The pattern of veins is a useful character used to classify insects. Wing muscles are attached to the wings at the base. By contracting those muscles, insects can move their wings. The wings of birds are the anatomical structure in birds, aiding them to flight, which is their primary mode of locomotion. In common sense, birds are a group of endothermic vertebrates characterized by the presence of feathers, toothless beaked jaws, four-chambered heart, and strong, lightweight skeleton. Also, birds have a high metabolic rate, and they lay hard-shelled eggs. Generally, the forelimb of birds is adapted to fly by forming wings. 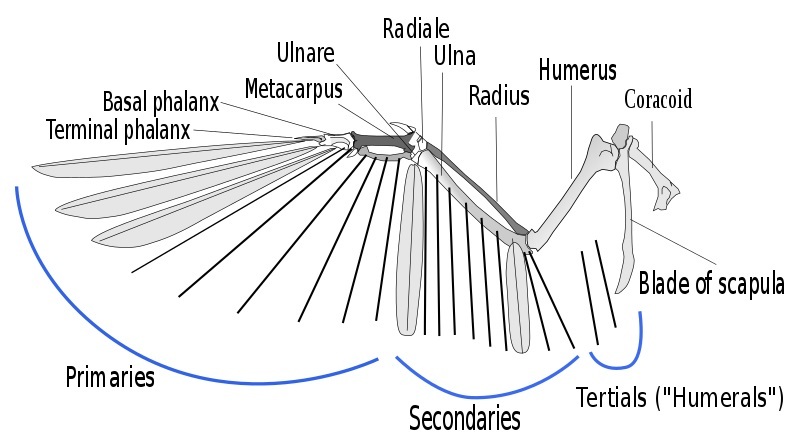 A wing of a bird is composed of three bones: humerus, radius, and ulna. The hand consists of three digits, which serve as anchoring points for the primaries, one of the two sets of flight feathers. The second set of flight feathers is known as secondaries, which gives an airfoil shape for the wings along with the primaries. Wings of insects and birds are two types of analogous structures. However, they have a similar function, aiding animals to fly, but insects and birds are not related organisms. Wings of insects refer to the adult outgrowths of the insect exoskeleton that enable insects to fly while the wings of birds refer to the movable, feathered, and paired appendages in birds. 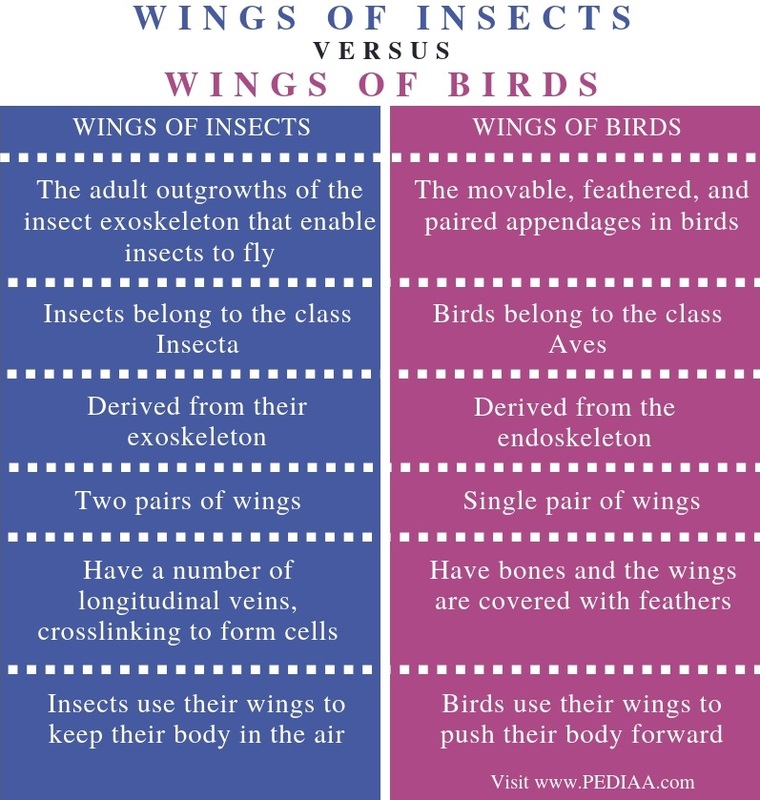 Thus, this is the fundamental difference between wings of insects and birds. Insects belong to the class Insecta while birds belong to the class Aves. Also, the wings of insects are derived from their exoskeleton while the wings of birds are derived from the endoskeleton. Hence, this is a major difference between wings of insects and birds. Furthermore, one other difference between wings of insects and birds is that the insects have two pairs of wings known as forewings and hindwings while birds have a single pair of wings. Moreover, the wings of insects have a number of longitudinal veins, crosslinking to form cells, while the wings of birds have bones and the wings are covered with feathers in birds. Their role is also an important difference between wings of insects and birds. Insects use their wings to keep their body in the air while birds use their wings to push their body forward. Wings of insects are the outgrowths of the exoskeleton of insects, aiding them to fly. Generally, insects have two pairs of wings that are made up of a number of longitudinal veins with cross-links. In comparison, the wings of birds have a bony structure and from the outside, these wings are covered by feathers. 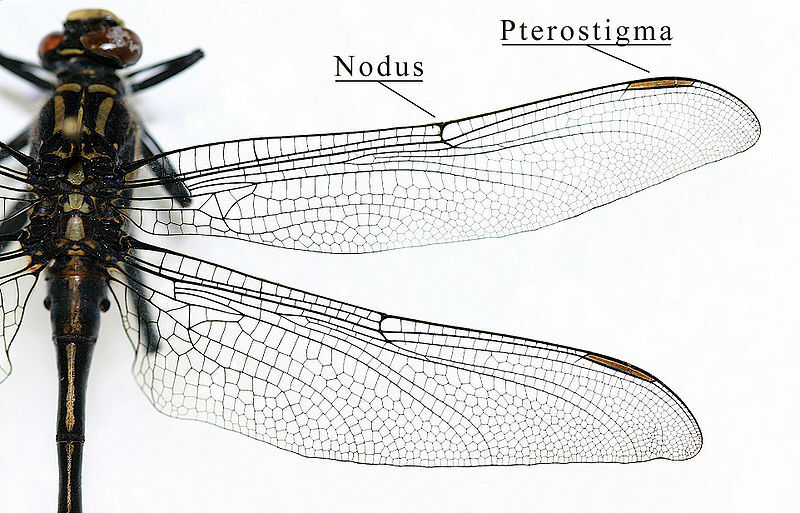 Both wings of insects and birds are an example of analogous structures developed by unrelated organisms with a similar function. However, the main difference between wings of insects and birds is their structure. 1. “Animal Adaptations: Homologous vs. Analogous Traits.” Dr. Whitson’s Bio Lab Review, Available Here.